“We sit on the border of East and West, but we’re always looking west,” says Dritan Xhengo, who established Past and Present Journeys ten years ago, to introduce tourists to his native Albania. For decades, this small country, on the western side of the Balkan Peninsula, surrounded, on one side by sea, and the other by Slavic dictatorships, was shut off completely to the outside world. Food was rationed as recently as the early 1990s, until Albania finally became free and independent in 1992. From 1961-67, Albania’s borders were fenced in, with no one going in and no one going out. The beauty in simplicity … Saranda Beach. 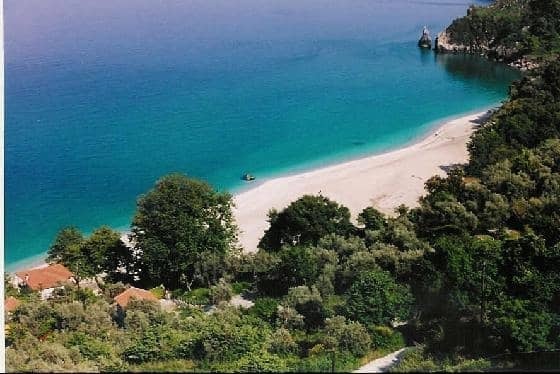 Even the beautiful southern beaches were off-limits to Albanians for their close proximity to the Greek border, just 1 km away, by sea. But, with the lifting of those restrictions twenty years ago, Albania has become a destination on the rise. In 2014 it will join the list of countries hoping to be considered for EU membership. But for the intrepid traveller who prefers beating a new path rather than following one, Albania offers some of Europe’s last undiscovered beaches, as well as surprising culinary appeal. We begin our week-long tour from the Greek island of Corfu, just a 30-minute ferry (on a fast boat), from the Albanian port of Sarande. Our primary interest is the coastline, with a bit of culture and cuisine mixed in. 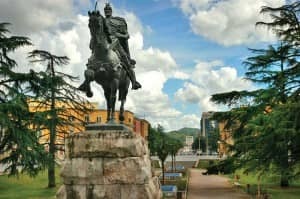 Regular flights to Tirana make a northern Balkan tour of neighbouring Macedonia, Kosovo, Montenegro, Bosnia & Herzogovina and Croatia all accessible by car. Our first lunch is just near the port, where we feast on fresh oysters caught hours before, in the Ionian Sea, washed down with white wine as crisp and clean as a green apple, from Albanian’s biggest vineyard, Cobo, in Berat. Small production limits the export market, and it’s hard to source the wine even a few hours away; our first glimpse of the very regional nature of Albanian food. A local chef prepares a multi-course, formal meal using only local products – black olives from an orchard just 10 miles away for a paste on thick country bread, and kiwis from the kitchen’s garden macerated, then lightly dosed with champagne and topped with a small dollop of vanilla cream for a chilled puree I’d love to eat again and again. Wandering around Sarande after lunch, we take in the ruins of an ancient synagogue, home to Albania’s Jewish community. The country has the unique and admirable distinction of being the only European country to save all of its Jews from deportation during the Holocaust. Albanian Prime Minister Mehdi Frasheri struck a deal with the Nazi’s who came here en route to Greece, to protect its Jews, part of the long-standing Albanian tradition to treat guests better than yourself, and ensure their safety. Frasheri instructed all Albanians to take in any Jewish children at risk and treat them like their own. By nightfall, we reach the hilltop town of Gjirokaster, heading northeast, towards Tirana. The UNESCO world heritage site is known for its stone once sourced locally, now a precious commodity. The Hotel Kalemi, with its traditional decor of stone archways and carved wood ceilings commands views of the valley below. Whereas lunch was sophisticated, European-style seafood, dinner in the mountains is warm, homey comfort food. Two different kinds of “meatballs” are the lightest I’ve ever tasted, absent of any sauce, simply seasoned with local herbs. 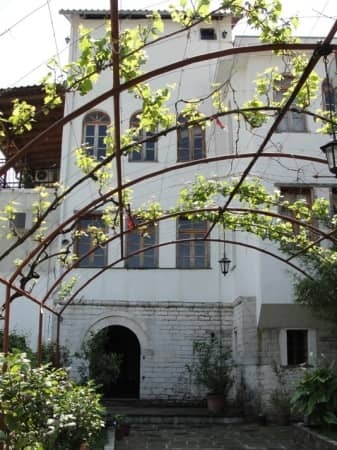 Architectural and political buffs will relish walking through the Ottoman-style homes and the former residence of Communist leader Enver Hoxha is now an ethnographic museum. The drive to Tirana is three hours, the roads filled with crazy drivers, making Dritan all the more valuable. We find Tirana’s only fresh seafood restaurant at the fish market, where the proximity to Bari and other Italian ports is present. Here, the bread tastes home-made and crusty; the pasta is al dente, served with fruit de mer, perfectly coated in a light tomato sauce. Tirana, with its wide, quiet boulevards, and massive, squatty, Communist-era buildings is a fascinating view to the past and the present. Bicycles for rent and entire, dedicated cycle lanes are a great way to explore the city. 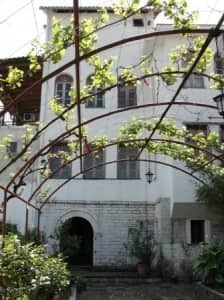 Our boutique hotel, the Sokrat is well-situated on the “block,” the area open only to government officials until 1991. It has become Tirana’s trendiest spot, filled with outdoor cafes, bars and boutiques. For serious foodies in the know, the Sokrat also serves a breakfast of an Albanian-style “cronut” – a very lightly sugared croissant, filled with either apricot jam (my favourite) or custard. We forgo the National Museum for the National Arts Gallery, another homage to the Communist era, when “bigger is better” was the dominant design theme. We are the only visitors on a Saturday afternoon, wandering several rooms of the popular Social Realist style of the 1960s. Much of the work is highly competent, demonstrating the government’s emphasis on artistic education. The Sheraton Hotel already exists in Tirana, and will be joined by a Hilton later this year, the first one in the Balkans. Sofitel is soon to follow. If multinational hotels are anything to go by, Tirana is moving up in the world. From Tirana, we make a loop, heading back down south, via a 13th century monastery in Ardenica. Its frescoes rival those found in Florence. As we wind down through the seaside town of Vlore, known for its fresh seafood, the wide, four-lane roads and pastel-coloured apartment buildings leading to the sea, are reminiscent of Miami or Fort Lauderdale. We pass through a short tunnel, and the water turns from the sapphire Adriatic to the turquoise Ionian Sea. The White Seagull sits on the edge of a white pebble beach in Palasa, with views of the water, and the mountains as a backdrop. Warm, toasted bread is served with a fresh tomato salsa (think bruschetta), and a mild, white cheese and yoghurt spread with hints of mint that’s so local we’re unable to satisfy future cravings for it. Small fillets of tender white fish are delicately laced with lemon peel, and octopus carpaccio is drizzled in Albanian olive oil. We could be anywhere in the Med, except we’d be paying at least twice as much. A small, Caribbean-looking cove, with pebbles and pale turquoise water makes up Llamani Beach with its handful of cool, chilled out restaurants and lounges lining the small inlet. It’s one of many alluring stops en route to Albania’s famous beach area, Ksamil. We’re expecting simple food, but are surprised and delighted by a vegetable risotto so good the chef must have been schooled by an Italian nonna. The tres leches is light and creamy, consistent with the Albanian habit of serving European desserts. Creme caramel, tres leches and panna cotta all feature heavily. Ksamil is famous for its well-photographed white, sandy beaches and clear, azure water. 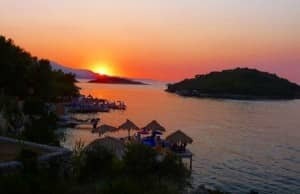 There are no resorts in Albania, and the beach is no exception; no luxury, and little tourism infrastructure outside of basic, small, family owned hotels. In return, our reward is a balcony where we have breakfast staring out at the sea, and spend quiet nights viewing paintings in the sky as a streaky sun smudges oranges and pinks before setting. Each sunset is more beautiful than the last. A small island beach is accessible by boat, or an exhilarating 700 metre swim, which isn’t as far as it sounds. The water is safe, still and shallow and a few tiki umbrellas at the front of the island offer seclusion. Around the back of the island, the Lion Club pumps up the volume with bass-thumping beats and a beach bar. Ksamil, and Albania, in general, is a great place for single travellers, couples and families to take an adventurous tour through a developing nation. Past and Present Journeys specialises in bespoke, niche tours, sending PhD’s on archaeological excursions with tourists who want a more academic insight, and political tours can be arranged to include thoughtful meals with former ministers and Balkan political analysts. >Treks, kayaking, rafting and horse-back riding are popular in the Albanian Alps, and Korce in the southeast, holds a weekly foodie festival gathering local chefs to prepare a multi-course meal together. We opted for tranquillity by the sea, but more than one Albanian sign instructed, “Less clothes, more music,” and there are plenty of party beaches for a mini-Ibiza. Our transit in Corfu only added to our trip, offering a few hours to compare the lovely, yet highly developed Greek island with unspoilt Albania. There’s a fortress in Corfu town, access to sea swimming just below the old town, and plenty of good souvlaki. For those hoping to uncover one Europe’s few remaining island paradises, as well as a bounty of culture and history, Albania’s simplicity will tick the boxes. In five to ten years, luxury may be in the offing, but along with it, will come the hoards of people, and the usual trappings of commercial destinations. Go now, before everyone else does. This entry was posted in News, Past and Present Journeys on September 17, 2013 by Richard Parks.